A component critical to the continuing cohesion of the Palestinian people is the sustenance of the Palestinian village. The village is the heart of Palestinian culture, it is every Palestinian’s connection to the homeland, and it is the village rituals, sights and sounds that are at the center of the Flower of the Countryside tradition. 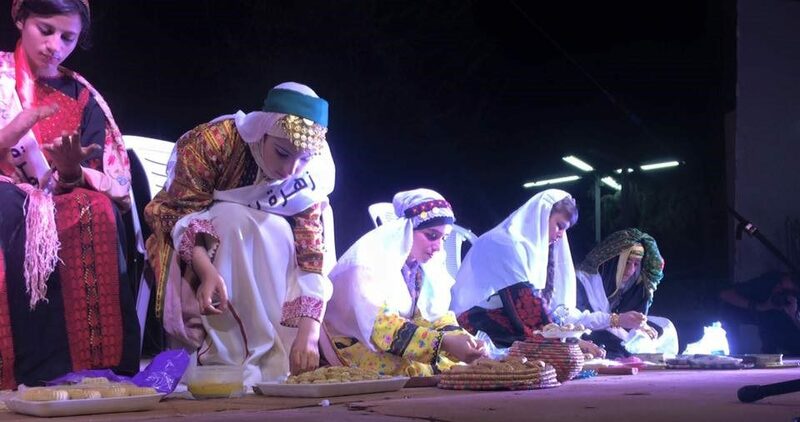 Held under the auspices of the Ministry of Culture, the tradition features young girls aged 12 – 16 who are escorted by their families and the people of their villages who will sing folkloric songs about their local agriculture as they accompany her. Each girl wears a dress unique to her village that displays the richness and art of Palestinian needlecraft. The girls exhibit their knowledge of their dresses as representational of their geographic area as well as their skills in braiding hair and painting traditional designs on pottery, thereby enhancing the value of the dresses as emblematic of this distinctive aspect of Palestinian culture. Each girl, accompanied by her family and members of her village, will sing traditional songs about the agricultural seasons that governed their lives in earlier times. While a young girl receives her “flower crown”, she is actually representing her entire village, especially the women, who have taught and supported her throughout the preparations. It is the people of the village who are transferring their heritage to the younger generation for safe-keeping. It is the village that feels the pride in knowing that its culture will be kept alive for future generations.